The pre-Hispanic goldwork of Colombia is traditionally classified by archaeological zones, or regions, each with stylistic associations, varying in iconography and technology: Muisca in the central highlands southeast of Bogotá; Zenú (Sinú) and Tairona in northwestern Colombia; and in the southwest, Quimbaya, Calima, Tolima, and Nariño. The richly varied works were primarily objects of personal adornment. Pendants, headdress elements, pectorals, bracelets, anklets, and nose and ear ornaments probably functioned as ceremonial regalia for elite men. 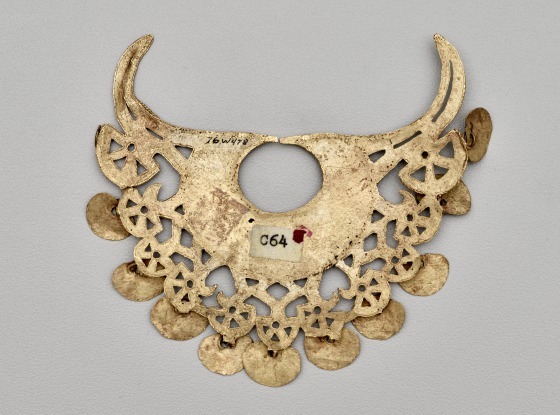 In contrast, however, Muisca gold objects consist primarily of votive offerings. Muisca gold objects were usually comprised of a concentrated copper-gold alloy, known as tumbaga, and created by lost-wax casting. Objects often had multiple parts, and the surface was often left unpolished. 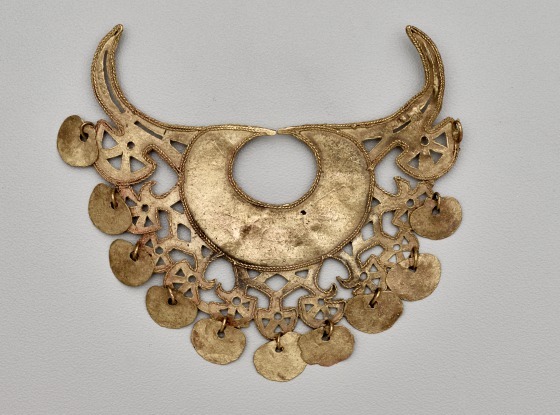 Since the Muisca region lacked a source of gold, they traded other precious materials to acquire the metal. Metalworkers favored objects with multiple parts and the addition of dangles, and the surface was often left unpolished, as in this example. This nose ornament features delicate openwork with cut-out motifs and braided elements with filigreelike detail. The disk-shaped ornamental gold dangles attached along the base would have created a dazzling golden image when worn. "Bird Pendant (1979.206.509)." In Heilbrunn Timeline of Art History. New York: The Metropolitan Museum of Art, 2000–.http://www.metmuseum.org/toah/works-of-art/1979.206.509/. (August 2009). "Bird Pendant (1992.121)." In Heilbrunn Timeline of Art History. New York: The Metropolitan Museum of Art, 2000–.http://www.metmuseum.org/toah/works-of-art/1992.121/. (August 2009).